One of my favorite parts of itch.io is how developers can take the creativity they put into their project and display it on their project/store pages. From the very beginning, one of itch.io's guiding principles has been about giving developers a page that they can customize with content that they control. Sadly, itch.io's project page theme editor hasn't really kept up with the development of the rest of the site... until now. Thousands of lines later, the oldest part of the site is now rewritten. Introducing the new theme editor! Updating the theme editor has always been a challenge for us. Thousands of developers use our page editor to make some really unique stuff, and when we make updates to it we have to be careful about inadvertently breaking their designs. 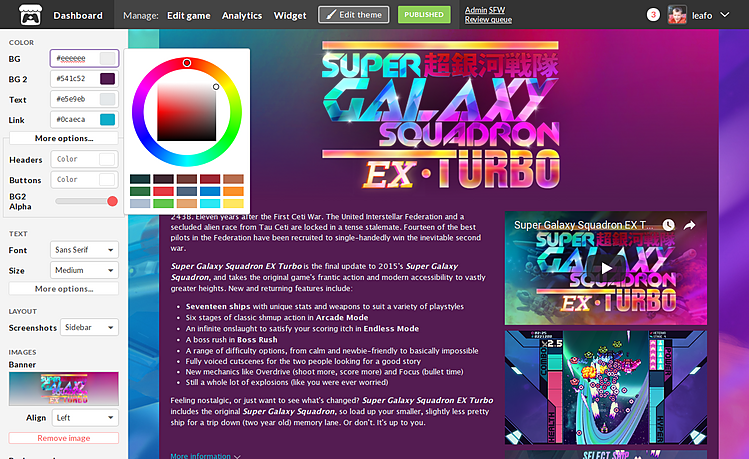 For this update I analyzed game pages using Custom CSS, since they're the most fragile. I viewed 600+ project pages, got to see a lot of interesting stuff, and took notes about the things they did. The most common changes became the inspiration for the new features that are available today, and the ones I have planned for the future. Theme editor now displays from the side. Has been completely rewritten with modern components. A brand new CSS Customization Guide that gives you some tips, a layout of the page from a CSS perspective, recommended selectors to use, and pitfalls to watch out for. CSS generated by us will now use lower precedence CSS classes so it's easier for your CSS to take precedence with an ID selector. The differences between browser and downloadable project pages have been normalized, they use the same markup where appropriate. Flexbox is now used for alignment in many more places. Try it out, and tell us what you think. With the foundation improved it's much easier for us to continue adding new customization options. Please don't hesitate to leave a comment here with any ideas you'd like to see. We are grateful for this change. We hope that more features will be added in the future. YYYYESSSSSSSSSSSSS. Thank you so much. Bless your heart. Everything little thing you add exponentially allows for people to create completely unique game pages, I love it. Please never stop improving profile/game theme editors, it adds such personality into the website - which I love. Please keep expanding this, you're on the right track. I've just updated the page for my main game with the new tools! Fantastic! Yeah. If you've noticed there two styles of theme editors. The goal is make make them all look and work like this new one. That's a good point, I think it would be worth having a account setting that disables the fonts, like how we have one to disable gifs.